There are skincare products that work hard and there are skincare products that work really hard. Most of us know what it feels like to wake up with a face that feels anything but glowing. And while a splash of ice-cold water might help drag some colour back to your cheeks, really tired skin might need some high-impact Omega 9 therapy! Abyssinian Oil 5 Minute Miracle Mask delivers a potent dose of hydrating Omega 9 to help smooth out fine lines and wrinkles. It also gently draws out any impurities. Five minutes is really all it takes to restore a healthy glow , so apply yours before you make some coffee and let the cat out. A couple of drops of Abyssinian Oil Aroma Facial Concentrate are all you need to provide a smooth, silky base layer for foundation or BB cream. This intensive daily moisturising oil helps balance sebum production and the teeny tiny molecules penetrate right down deep into the skin to help boost collagen and elastin (the building blocks of youthful, glowing faces). Abyssinian Oil Facial Activating Mist is formulated with a natural alternative to hyaluronic acid (one of the major components of skin, which acts a bit like a sponge to retain moisture). It’s our all-natural anti-inflammatory tonic for whenever your complexion needs an instant pick-me-up or makeup needs a quick on-the-go refresh. A couple of pumps are all you’ll need, so it’s pretty good value too! Your skin can start to suffer as the day drags on – especially during the winter when the dehydrating effects of too much central heating begin to take their toll. 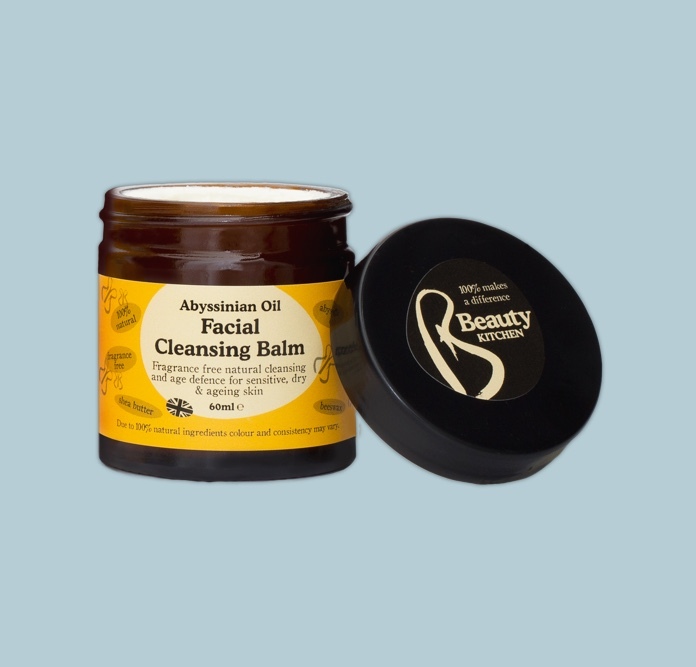 To the rescue comes our take-everywhere Abyssinian Oil Handbag Beauty Balm. This multi-purpose cleanser, moisturiser and exfoliant will quench the thirst of any skin type and helps to repair, firm and smooth too. Beauty Kitchen customers love it! We’re constantly reminded how important it is to remove all makeup traces before bed. One way to do this gently and effectively is with the Beauty Kitchen Miracle Mother Konjac Sponge. It’s eco-friendly and buffs away dull, dead skin cells as it cleanses. We recommend a pea size portion of Abyssinian Oil Facial Cleansing Balm applied to your face using upwards-circular motions. Remove with your damp sponge and any excess oils and daily grime will instantly melt away, leaving your skin feeling cleansed and soft! 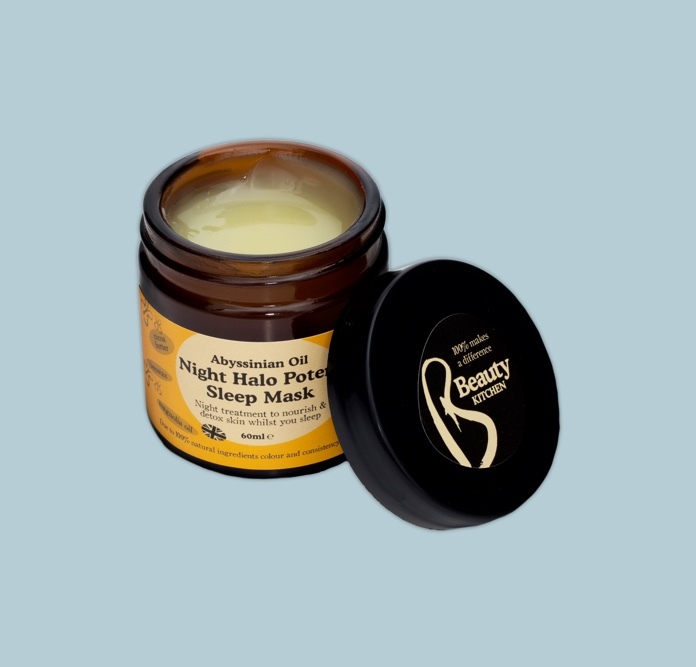 Swipe on your Abyssinian Oil Night Halo Potent Sleep Mask just before bedtime. A pea size portion will do the job and you won’t need to rinse it off until morning. Instead let the rich blend of oils nourish your skin as you slumber.